Building with AusHomes allows you to create a home that is a perfect fit for your family’s lifestyle. Building new allows you take complete control over the floor plan, design, fixtures and finishes of your new home and create a stunning space that is uniquely yours. If you are a first time buyer, the thought of building your own home can be a daunting one. 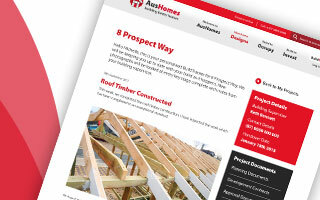 AusHomes are here for you, to explain and guide you through the entire process and ensure that at every stage, you are informed about how your project is progressing and what happens next. We make building your new family home simple by providing easy to understand, fixed price contracts and comprehensive standard inclusions which mean that on completion, you can just turn the key and walk straight into your new home and start unpacking! 100% of AusHomes are completed on time, but you can also enjoy complete peace of mind and regular updates on the progress of your build with BuildTracker. Through BuildTracker, AuaHomes communicate weekly with every client, sharing photographs of the build in progress and noting relevant milestones and next steps.